Malachite is an ore of copper a monoclinic copper hydroxycarbonate. 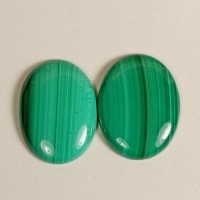 Malachite is usually found in opaque green masses, its color derived from copper. Crystals are too small for faceting, but the massive material is is carved or polished in many ways to reveal the alternatng bands of light and dark green. 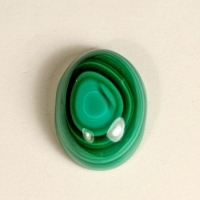 The cutter must work the malachite so as to show the decorative marking to its best advantage. 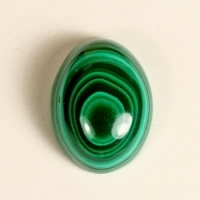 Concentric eye-like rings are most popular (called malachite peacock's eye). 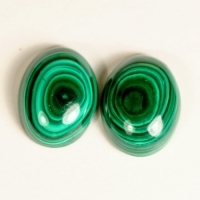 Malachite occurs in rounded nodules, grape shapes, cone shapes, or stalactitic and rarely, encrusted slabs. Formed from copper-containing solutions in or near copper ore deposits. The most important deposits used to be in the Urals of Russia. The quarries delivered blocks of over 20 tons in weight. From there, the Russian Tsars obtained the malachite for decorating their palaces, paneling the walls, and for beautiful inlaid works. 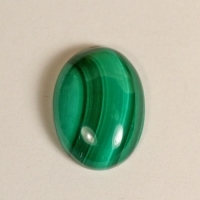 Today malachite is found in small amounts in many locations around the world where copper is mined. 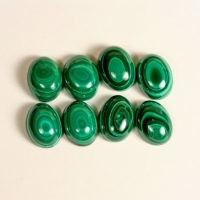 Zaire, the Congo, Australia, Chile, Namibia, Zimbabwe, and Arizona produce malachite. 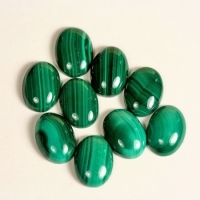 Malachite was popular with the ancient Egyptians, Greeks, and Romans for jewelry, amulets, and as a powder for eye shadow and as a pigment in paint. 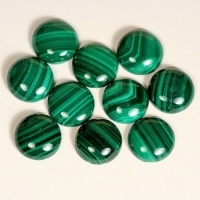 As an amulet malachite was worn to ward off danger and illness. Extra fine grade natural gemstones from the Congo. Extra fine grade natural gemstone from the Congo. Extra fine grade gemstone from the Congo.